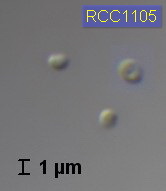 The strain deposited at RCC appears to be Ostreococcus. We do not know when the contamination occured. The Banyuls lab has recloned the culture from a cryopreserved aliquot (RCC4222) that can be ordered. Blanc-Mathieu R, Krasovec M, Hebrard M, Yau S, Desgranges E, Martin J, Schackwitz W, Kuo A, Salin G, Donnadieu C et al.. 2017. Population genomics of picophytoplankton unveils novel chromosome hypervariability. Science Advances. 3:e1700239. Limardo AJ, Sudek S, Choi CJae, Poirier C, Rii YM, Blum M, Roth R, Goodenough U, Church MJ, Worden AZ. 2017. Quantitative biogeography of picoprasinophytes establishes ecotype distributions and significant contributions to marine phytoplankton. Environmental Microbiology. Weynberg KD, Allen MJ, Wilson WH. 2017. Marine Prasinoviruses and Their Tiny Plankton Hosts : A Review. Viruses. :1–20. Moreau H, Piganeau G, Desdevises Y, Cooke R, Derelle E, Grimsley N. 2010. Marine Prasinovirus genomes show low evolutionary divergence and acquisition of protein metabolism genes by horizontal gene transfer. Journal of Virology. 84:12555–12563.